It looks like CLAMP are slowly offering a color page to each character and this time it was Eriol and Clow’s (sort of) turn. Don’t you love when CLAMP plays with dual personality/identity in either reflection or shadow like that? It is also worth mentioning that Card Captor Sakura is featuring the cover of Nakayoshi for the second time in a row and next month it will feature again — which means three months in a row! I don’t fully understand why is Sakura with bunny ears if this is supposed to be a Christmas-y illustration, haha! So not much happened in this chapter, since it’s a very action-oriented chapter, but we did get a lot of Syaoranness for everyone who was missing it. Sakura notices her shoelaces are loose and after she ties them, she notices something strange around the school’s fence. She quickly draws her Dream Staff and attacks right away with GALE. The attack bounces right back at her. She uses ACQUA afterwards to find out the card’s shape and secures it away. We learn it’s the REFLECT card, which looks like a pretty butterfly. Could this be a counterpart of The Mirror? All the more, could the Clear Cards be rebelling against her? Or maybe it’s just ACQUA’s bad temper. Syaoran then appears (how convenient him appearing when all the trouble is gone) and gives his coat to shelter Sakura in a very classic CLAMP moment. Sakura looks happy and loved. Sakura sure is getting card after card. Feels like CLAMP are rushing that for what’s to come next… I’m not complaining! 32 pages for the chapter — slightly less than the usual 35 pages. 32 pages for volume 2 so far. 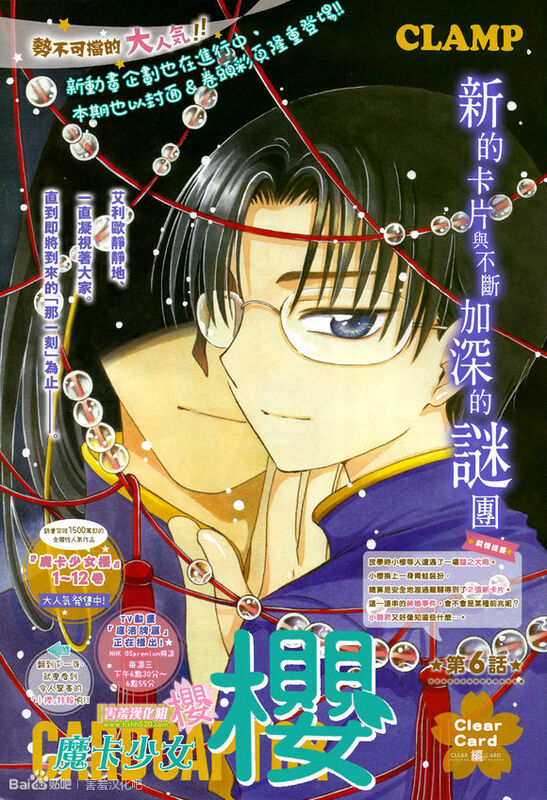 As I mentioned above, next issue will have Card Captor Sakura again on the cover. Doki doki! Make sure to check the News page in the scans, it has a first look to the cover art for volume 1 — it looks like it’s gonna be very similar to the classic edition with the white background and flower petals flying around. Also, we get to see a little more of the mangaka set that will come with the limited edition of volume 1. Lastly, it looks like the “big news” that were expected for this month’s issue were not so big after all. It’s just a revival project of the first Card Captor Sakura movie that will be screened again in 7 cities across Japan. But don’t worry folks, this is NOT the new anime project that was announced with Chapter 1. We’re still getting that, eventually. Maybe some info. will reveal next? A little bit more will be revealed next chapter, or maybe nothing at all xD We all know how these things work, haha! This arc is just before the TRC, events may be caused by Fei Wong Leed and will result in the scene where Sakura gives her staff to the clone Sakura. I got what I wanted! (Sort of. Now I can upgrade my wish to “color illustration of Clow with his face actually visible.”) Clow having his face obscured reminds me of how Yuuko was always portrayed facing away from the viewer in the “Rou” volume covers — it’s like they’re both “beyond the veil,” so to speak. AQUA treating Sakura with disdain isn’t a good sign (maybe it has a haughty, regal personality to match the crown on its head?) GALE getting reflected so violently at Sakura doesn’t bode well, either. It seems like Sakura and co. are taking a lot of blind steps here. When I saw the ad for the manga-ka set included with the deluxe edition, I noticed that stencils for the Star Key and Sakura’s keepsake box were included, which made me realize that we haven’t gotten confirmation on whether or not this new key is an upgrade of Sakura’s old one. Is the Star Key still sitting in that box? Did Sakura really start using a new staff without knowing where it came from? I wonder if Sakura getting a waking dream of the antagonist is related to the lights on Syaoran’s rashinban. She’s got four cards, so he should have four lights now, right? Yes, I did notice that! =) The crystal/icy seems to be really important for the plot. Each time more and more clear and less and less of a coincidence. GALE getting reflected so violently at Sakura doesn’t bode well, either. It seems like Sakura and co. are taking a lot of blind steps here. Well, I don’t remember the Clow Cards being the friendliest, either. we haven’t gotten confirmation on whether or not this new key is an upgrade of Sakura’s old one. Is the Star Key still sitting in that box? Did Sakura really start using a new staff without knowing where it came from? Right! But I don’t see how the rashinban could be related to the cloaked figure…. yet. I wasn’t referring to REFLECT attacking Sakura with GALE — that’s pretty much par for the course. What bothered me was the sense that GALE didn’t seem to know or care that it was getting shot right back at its new master. You can compare it to Watery back when Sakura tried to use it against Eriol’s rain at the beginning of the Sakura Card arc. Watery was a violent card at first, but when her power was reflected, she just panicked in place. None of the Clow Cards ever tried to hurt Sakura after she caught them and wrote her name on them. 32 pages for the chapter — slightly less than the usual 35 pages. 67 pages for volume 2 so far. And yes, I’m glad to have some ‘Syaoranness’ XD : since he was missing in last month’s chapter, I haven’t seen him for 2 months! There doesn’t seem to be much change on his side though: we didn’t get anymore info about him in any way, not his magic, not what he did in HK the past years, not his new battle costume, nothing… He did seem to have said something in the very first pages of the chapter, but since it’s something he ‘publicly’ shared with their classmates, I’m not too sure if it will be of any great interest. I would say Chapter 5 is from volume 1, but I could be wrong. Could Amazon’s page count be wrong? And regarding your FB, I see… I just wanted to have you on FB as well since we could interact more easily. Do you have any other social network at all? i love not knowing who this mystery hooded person (antagonist?) is. and i love how secretive (maybe even guilty?) syaoran is being too. complete contrast to his strikingly honest persona. eriol is clearly forcing him to be this way. clamp have done an amazing job in showing us the smallest and simplest changesper chapter, and characters the moods that sets the stage for something very sinister and possibly even dangerous. less really is more in some cases. and that is done to perfection every chapter in clear card. syaorans expression, and the lack of eriols advise and presence is really felt. its left me feeling nervous for sakura. but i really cant make up my mind if this mystery person is and antagonist or not. but the foreboding threat and mystery reminds me of yue arc. we didnt know who he was or what he looked like, all we kept hearing was his name and that he was the moon guardian. big reveal in final book was yukito of all characters. i remember being convinced it was either kaho, or touya ^^. on another note, that xmas theme magazine cover, the bunny ears look random for xmas. perhaps more spring/ easter feature, but im gona go with snow bunny? and im LOVING the colour cover. it gorgeous! i am biased! clow reed is my favourite overall male clamp character (even though we don't know barely anything about him!) i think this is my favourite chapter cover so far. so mysterious! is it me, or is this cover more holic-esque than ccs? i dont remember seeing a cover this dark for ccs? either way its NICE! I noticed that, but I don’t think they are related… do you? is it me, or is this cover more holic-esque than ccs? i dont remember seeing a cover this dark for ccs? either way its NICE! The splash page looks like a reference to this color illustration from the original run of the comic! no i dont. i think its all completely separate. again im so sorry if this link doesn't show up! ^^; but the good news is its been scanlated already. So! Syaoran is not joining a club, even though it was said in a previous chapter that it was obligatory… I suppose he will justify himself to the school with the fact he just moved to Japan, which is what he said here too. It’s quite ironical though, to hear him say that he’s go so many unfinished things to take care of, which is completely opposite to what he said in the end of the first series and the first chapter of this 2d series: about him having finished all he needed to do ^^; We can argue he is talking about different things, of course. Other than that, she still catches the new cards as easily as ever, she didn’t encounter any major difficulties so far, nor suffered much, other than this drenched in water thing, which seems to show that ACQUA might be capricious, simply doesn’t care, have no mind of her own, or Sakura do no know how to fully control her yet. syaoran looks a bit different too compared to the original drawings. i think its his eyebrows more than anything. they’re… higher… i think? i know his hair is more scruffy, but i think its the eyebrows especially. I usually do not compare reality with fiction: I agree with you that in 1 year and a half, kids could possibly change very little, but this is a manga, and we had a Time Skip in the future, in which the characters are ‘supposed’ to be different (in this case, they are kids, so they should grow), this is the readers’ expectation, and this is exactly what CLAMP gave us in the last pages of vol12. But they went back on their character’s design, either because CLAMP decided they would be younger (meaning that in the 90’s they imagined their reunion as 14-15 y.o. adolescent, not 13 like now? ), or because they honestly though they had made them look too old in their 90’s work…but this is clearly not a simply change of drawing style. It indeed looks like Touya will have some role to play at one point or another, else CLAMP wouldn0t have bothered having him tell us that he acquired a new kind of power. 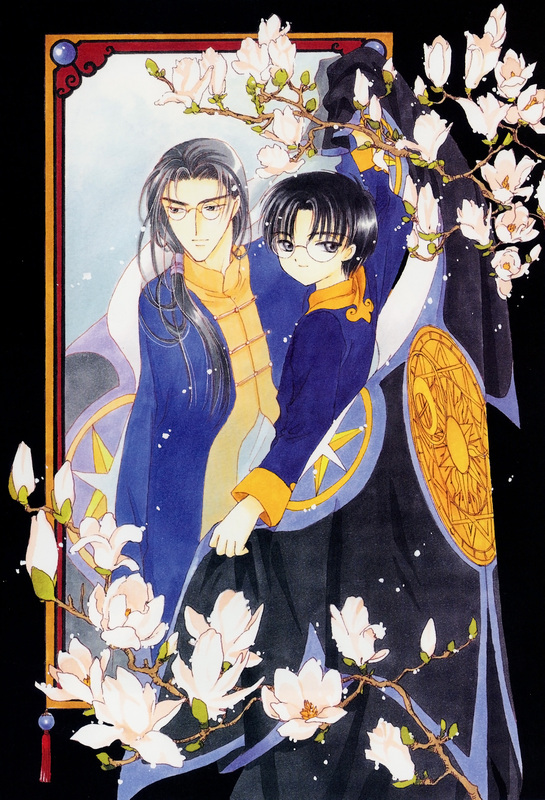 But as for Sakura’s father, whether in the 1st series or now, it doesn’t seem like CLAMP have any big plans for him: he is now aware of his daughter’s powers, but they clearly do not talk about it, and Fujitaka made no show of having used his magic in any other way than to see his deceased wife, Nadeshiko. All in all, even if and when Touya and Fujitaka are involved in the plot, it would very unlikely be for something big. Anyway, much of what I wanted to say has already been said from earlier commenters, I was just very happy to finally see Syaoran acting like a boyfriend/someone who’s in love with Sakura!! He’s still suspicious as hell, appearing right after the capture of the new card, but I still stick to my undying trust in his good intentions. About Sakura, it’s so exciting to see her acting against the new cards all on her own, thinking about the right strategy and picking the right card to help her securing the others! You can really see how she’s grown up there, not much on the physical side, but rather on her mind and magic . I’m waiting eagerly for the next chapter, it looks to be one of the best ever, with the announcement about the new anime and the new encounter with CloakedGuy ! These chapters do have the worst timing! Yes, precisely. Kero is rarely around, too. She’s been figuring things out all by herself, and it shows. Also, it took really little effort for her to secure the card, just like all the other cards before…I’m more and more convinced that securing the cards isn’t the real deal here. I was just very happy to finally see Syaoran acting like a boyfriend/someone who’s in love with Sakura!! He’s still suspicious as hell, appearing right after the capture of the new card, but I still stick to my undying trust in his good intentions. Sakura's reaction was so sweet! And you are right, Sakura has been acting solo a lot, no Kero, no Syaoran, and no Tomoyo filming. Sakura’s reaction was so sweet! Cutesherry, just as a heads-up: the regular edition of CCS Clear Card Arc Vol. 1 has been made available for preorder on CDJapan. Another thing I wanted to add and came to mind only now: FINALLY we have Sakura making questions to Syaoran about his behaviour/words!! Of course she believes his reply right away (well, it couldn’t be more vague, so when someone replies like that you have two options: either being nosy and insist asking “yeah ok but what is it that you have to do?” or drop the subject entirely), but I’m glad she’s not ignoring his misterious ways of “being busy”. Of course I’m waiting for her to be more and more aware that something is going on. As I’ve read somewhere, Sakura is naive yes, but that is very different from being stupid. And as I said in an earlier comment: it’s quite ironical to hear him say repeatedly at every chapter that he’s go so many unfinished things to take care of, which is completely opposite to what he said in the end of the first series and the first chapter of this 2d series: about him having finished all he needed to do ^^; We can argue he is talking about different things, of course. it’s quite ironical to hear him say repeatedly at every chapter that he’s go so many unfinished things to take care of, which is completely opposite to what he said in the end of the first series and the first chapter of this 2d series: about him having finished all he needed to do ^^; We can argue he is talking about different things, of course. Yeah, you got a point there… it all started saying he finally finished everything, and now he’s dragging this lame excuse on and on…he’ll end up being busted in no time (Tomoyo I’m waiting for you). Now that I’m at it, another thing I imagined since the very beginning, was that Sakura might start having dreams while being awake, in full Watanuki style, and then BAM! This chapter didn’t disappoint me. 😉 But I’m also worried about this…if it gets frequent, it might upset her normal life and she might end up unable to distinguish the dream from reality…or having “dreams inside a dream” (it already happened!) and be trapped inside of it. This power seems to be revolving around dreams, it’s very fascinating but also quite scary. We’ll see how CLAMP will make use of that. A new teacher this time again, P.E. I need to reread the first series to see at what rhythm they were introduced last time. A fourth card, Reflect! They still manage to cramp a lot of stuff in each chapter. Some school drama, some family drama, some card action, some Eriol. And I didn’t even know what lacrosse was up to now….